Show time: Sat to Mon and Wed and Thurs 10:30 AM to 5:30 PM, Tuesday closed, Fri 10:30 AM to 8:00 PM thru July 28. 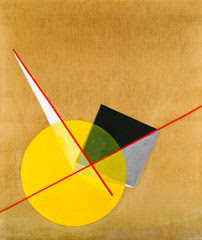 This show compares the unconventional optical techniques that the “New Vision” generation of artists used in the 1920s (László Moholy-Nagy, Hans Richter, and Marcel Duchamp) and those same techniques that were used and improved on by artists of the 1970s (Gordon Matta-Clark, Robert Smithson, and Anthony McCall). Though small, Supermac packs a hearty punch with it’s gourmet mac & cheese’s like the Mac Cheesesteak with shaved steak, caramelized onions, roasted peppers, cremini/shitake, provolone, and white American ($8.25 mini; $10.95 mega). A great place in NYC to get a full-bodied dark beer is at Stout. With a very detailed beer list with descriptions, I’ve never had a bad pint at this bar and restaurant, plus the food menu is American and quite good. Probably the biggest 99-cent store in NYC, Jack’s is three floors of some of the finest values you can find, especially in an overpriced area like Herald Square.